Brad from the Cinema Guys ( www.wearethecinemaguys.com ) explains how he was approached by a small local Cinema Chain who listens to his podcast. Brad worked a deal that enables him to get tickets to movies. Brad (being the cool guy he is) is using them as a give away for his audience. He has also worked to do a screening of Brad's all-time favorite horror movie, “John Carpenter's The Thing.” They get to introduce the movie and then do a Q&A afterward. It keeps you focused. You are no longer distracted by things that don't help you achieve your goal. If you know why you're doing something, you can see the results clearer. This enables you to spot the small victories that then motivate you to keep going. It is then the motivation that enables you to try again. When another small victory comes along, you get another dose of motivation, and a pinch of this thing called confidence. I had been wanting to lose weight, and over the last year, I have been going up and down. I would get down to maybe 218 lbs, and then go up to 221 or 222. I wanted to get up and go to the gym in the morning. I knew to drink lots of water, and get plenty of sleep. I knew what to do. However, when I listed my priorities I wrote down things like rewriting my book More Podcast Money, I needed to update some tutorials at the School of Podcasting, and take a class on SEO. Nowhere in there is anything about my health. That's when I realized why I wasn't losing weight. It simply was not a priority. I got a call from letting me know that I was being inducted into the Academy of Podcasters Hall of Fame. The minute I hung up the phone, I said out loud, “Well somebody's getting up early tomorrow.” While it is somewhat weird, as I normally try not to care what people think of me, I knew there would be lots of pictures. I even hired a photographer to take pictures during my presentation. Suddenly, like a light switch, I had willpower. I had focus. I had a purpose. No longer did I need to watch TV. I realized that most of the taped TV shows I use to watch rarely delivered any real value. I could take that time and use it at the gym, or walk around, or cook healthy food, and THAT would deliver value to my goal of losing weight. I listened to my first episode, and in it, I mention in April of 2005, there were maybe “4000” podcasts. This article says in 2005 there were 3000 podcats, now there are 550,000 and according to this TechCrunch article, there have been Fifty billion episodes have been streamed/downloaded since launch. The new numbers include 18.5 million individual episodes representing 155 countries, in more than 100 languages. So in 2005 when I was explaining to people how cool podcasting was, and how awesome it was that you could “teel the software to watch this site” (better known today as a subscription) and that you didn't ‘ need a Mac, and you didn't need an iPod to listen. IT WAS PAINFUL as many people just didn't get it (it took a while for me to get it). But I knew the potential power of podcasting, and I had quit listening to radio, and I wanted people to experience the same joy I had found. It didn't seem hard because if I helped ONE person understand and start listening to podcasts, and I had ONE more person to talk about Dawn and Drew with, it was worth my time and effort. When you know you're why the “work” doesn't seem like work. It just seems like something you do. When I first started playing the guitar it was BRUTALLY PAINFUL, but I knew I wanted to play. I wanted to be like my brother (who played) and so the pain wasn't so bad. I knew it was temporary, and I could make it through the how. It's creative (my hobbies are music, writing, photography, poetry). I get to leave a very small fingerprint on the planet. Neither of my marriages produced any children. The word “Legacy” seems a bit much, but you get my point. I am meeting and creating great friends. I'm not sure what I would do with my free time if I didn't. When accomplishing these little milestones, it feeds your motivation to keep going. Jim Collison from The Average Guy Network (and my Co-host for Ask the Podcast Coach) is a lot like me. We both love being around people, we both love helping people. We both like to talk and to influence people to help them do things. There is a reason that employees at companies are strongly urged not to share their income amount with other employees. If two people share that information, one person is leaving that meeting upset. So when people share how many downloads they get in a Facebook group, and their numbers are three times as many as you, ignore it and instead of focusing on their numbers, focus on your audience and how you can serve them. Wouldn't you be able to see why someone might be getting more downloads than you (and keep in mind, there are more ways to measure podcast success than downloads). So unless you want to detail your podcast DON'T COMPARE YOUR SHOW TO OTHER PODCASTS. The Heil PR77D is basically a Heil PR40 with a bass roll-off switch, and something that will look very cool in any videos. It comes in black and purple and retails for $249 where the Heil PR40 is $308. You will hear these with my mic preamp the DBX 286 $199 off during the shoot out. 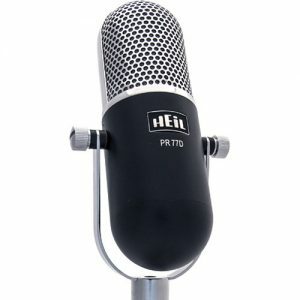 The Heil PR77D has that traditional warm Heil Sound. When I switched it voice mode (which cuts out frequencies below 120Hz) it seems a little too clear for my voice). It comes with a nice black velvet bag to keep it in. It's a very sturdy microphone, and I love the retro look. Of the microphones above, the only one I steer people away from is the Blue Yeti unless you PROMISE to read the manual, buy an over-priced pop filter, and use it on a boom arm. I personally use the Electrovoice RE320, but I liked the warmth of all the Heil Microphones and I need to play with it a little more to see how the proximity effect is (if it has more bass when you get close to it). The rear rejection seemed about as good as the other microphones. Great episode as always Dave. First off, congrats again for the Hall of Fame. Well deserved. We all thank you for paving the way, encouraging us, and teaching us to “podcast in the right way”. Also, I’m a big believer in knowing your WHY as well. Really loved what you shared with that and how it’s made you make shifts in how you do things. 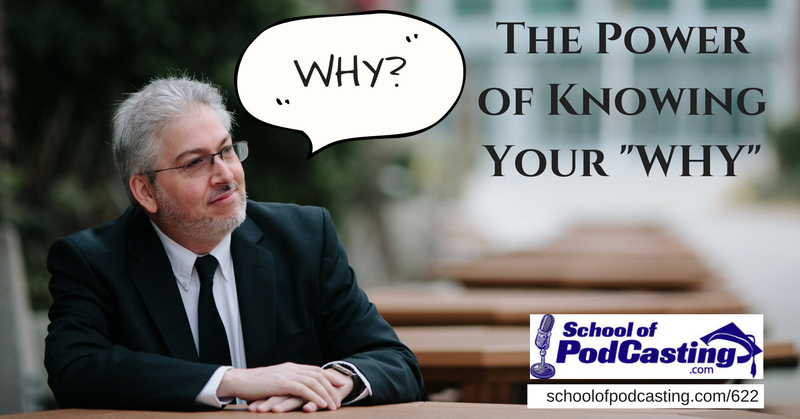 I think the podcasting community is such a great place because so many of us who launch a podcast do it because we have a why and want to make a difference. From an old buddy and podcaster, I want to salute you on your podcasts. I will NOT be attending PM this year, as my health problems with AO and other complications will not allow me to travel. As you know, my 16 podcast shows have gone down to 1, and I have a difficult time to record and publish an episode. I hope that my health can improve so that I can once again podcast on http://www.PodcastReporter.com. In the meantime, I have to recover from my health surgeries and complications , now that I have reached my Twilight Years. But I really wanted to congratulate you for being inducted in the Hall of Fame. I know that you have deserved it (as I know you deserved the award-winning title for the ten years I voted for you). So, I am very glad that you will be recognized for this achievement. Well deserved and finally rewarded with your induction. Take care, buddy, and I am still a great fan and listen to schoolofpodcasting.com and other shows you have given to us. 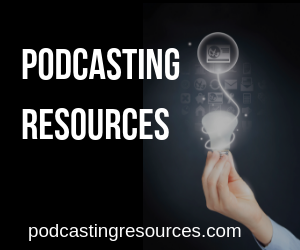 I do remember that you helped me get into podcasting in 2006 and am grateful. Forgot to mention that one of my low-priority goals and objective in podcasting was to have over a million downloads. Yes, my numbers now reflect me as way over 1.5 million downloads in podcasting.